Join us April 9 from 10 a.m. to noon, when Bike New York comes to Train the Trainers for our West Windsor Bikes: “Lose the Training Wheels” session at the Farmers’ Market on May 21, when we’ll teach children to ride bikes without training wheels. We’ll start our training session at the West Windsor Library and then head outside. Please email us at wwbikeped@gmail.com so we can know to expect you and contact you if plans change because of bad weather. Click here to read about the Balancing First Method. Trenton Cycling Revolution, a bicycle advocacy group, is coordinating a community clean-up along the D&R Canal in Trenton on Saturday, April 2. Volunteers will meet at the Mulberry Street entrance to the recently completed section at 9 am and work for approximately two hours. Coffee and gloves will be provided. More information here. George Fallat, Mercer County’s traffic engineer. George has been a big supporter of bicycle and pedestrian improvements on county roads. We can thank him for the wide shoulders on the repaved portions of Washington and Clarksville roads this past summer, the crosswalk at Avalon Watch, including the pedestrian refuge island, and support for Share the Road signs on county roads (paid for by the WWBPA and BikeFest and installed by the county), among other improvements. We also credit him with helping to facilitate the improvements at the intersection of Route 571/Princeton-Hightstown Road and Wallace and Cranbury roads. George has always been ready to listen to suggestions from the WWBPA and we look forward to working with him in the future. 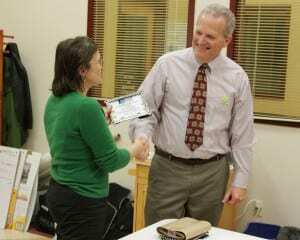 Alex Drummond is West Windsor’s director of public works. His team has installed bike racks at the farmers’ market and racks and bike lockers at the train station. His crew also took down the lockers at the Howell bus station that were moved to West Windsor. None of these projects could have happened without some heavy lifting from the public works department. In addition, many share the road signs around town have been installed by public works. We can’t thank you enough for all of this. Ken Jacobs is the head of West Windsor’s recreation department and one of the behind-the-scenes forces of BikeFest. This annual cycling extravaganza wouldn’t work as well without his help. 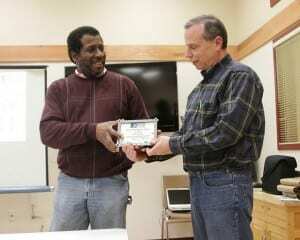 His award was accepted on his behalf by Dan Gerstenhaber, the driving force behind BikeFest. Moving Beyond the Automobile: Biking from Streetfilms on Vimeo. In a recent episode of Moving Beyond the Automobile, a Streetfilms.org series, Portland, OR Mayor Sam Adams claims the total cost of their city’s award-winning bicycling infrastructure is the same as 1 mile of 4-lane freeway. What does Politifact.com have to say about that? 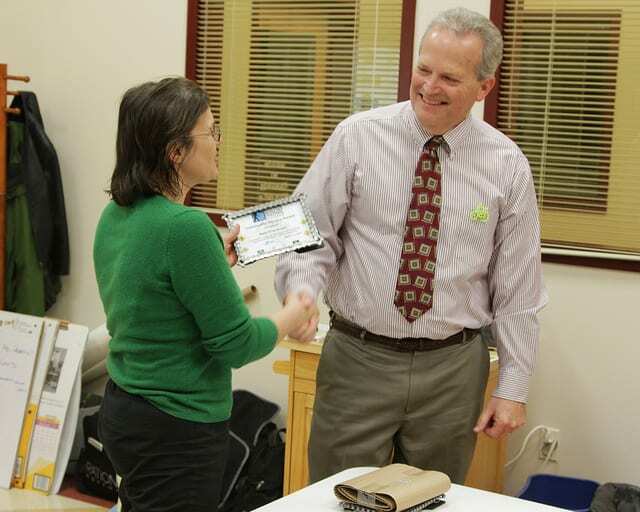 Portland is a national leader in building a bicycle and pedestrian friendly community, one of only three Platinum level Bicycle Friendly Communities, according to Andy Clarke, President of the League of American Bicyclists. To compare against the cost of a freeway, Politifact used several sources – costs were reported to vary widely depending on the surrounding environment, from $20 million to $80 million per mile for a 4 lane urban freeway. So Politifact gave the mayor’s statement a Mostly True! Of course we’re all concerned about cost, but what about value? What return does Portland get for its investment? We’ll take that up in a future post. 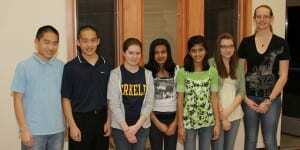 The WWBPA is delighted to have six new student advisors for the next year. They join Rachel Karp, a sophomore at WW-P North, who is returning for a second year. We’ve never had a group this big, and we are looking forward to their input, enthusiasm and the extra help with our many projects. 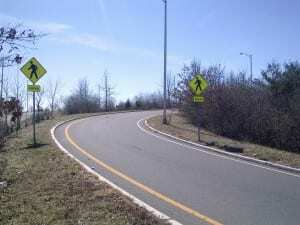 Big thanks go out to NJ DOT, who recently installed new warning signs for the multi-use trail along Scudders Mill Road, where it crosses the ramps onto and off of Rt 1 northbound. The signs are extremely important for the ramp from Rt 1 northbound onto Scudders Mill Rd westbound, since that crossing is a high speed cloverleaf merge with very short sight lines. Additional warning signs are in place around the midpoint of the cloverleaf. Today this ramp doesn’t see that much traffic, mainly serving U-turns to southbound Rt 1. In the future, however, there is potential for a lot of traffic, if the proposal to restrict westbound turns from northbound Rt 1 at Washington Rd and Harrison Street is adopted. The Safe Routes to School National Partnership announced the release a new publication, Bicycle and Pedestrian Curricula Guide: Making the Case for Bicycle and Pedestrian Youth Education. 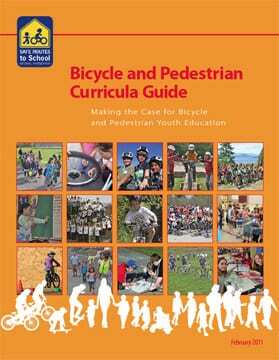 The guide, created through a contract from the Centers for Disease Control and Prevention, is intended to give Safe Routes to School practitioners, teachers, school administrators and others the necessary background information to fully understand the positive benefits of teaching bicycle and pedestrian education in the classroom, and to provide these audiences with easy access to currently available curricula. The guide and its accompanying inventory are organized into descriptive categories that will help in choosing the right curriculum for specific classroom needs. OK, we know. 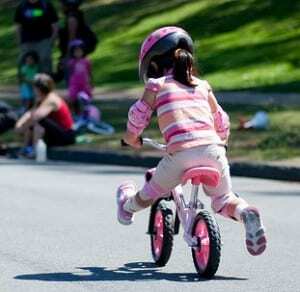 For some people, bicycle helmets are just so uncool that they don’t want to wear them. And then they mess up your hair. We haven’t come across a solution to the hair problem, but we have spotted some fashionable helmets that the Cycle Chic movement would approve of. At the New Jersey Bike & Walk Summit, Jerseyite Cheryl Allen-Munley was showing off girly hats that cover her helmet shells, all sold through her company Bandbox. A floppy hat with flowers and a brim? Or a felt 1920s cloche for winter? For those who prefer something more rugged, choices include a bush hat and a baseball cap. Some prefer helmets that look better suited to skateboarders. Cycle Chic (the name of a real store in the U.K.) carries some among its four brands (check out Nutcase). What would your fashion helmet look like? We just have to share this heart-warming story of a small town that built a camp for cyclists pedaling through (often on the TransAmerica or Lewis and Clark trails). 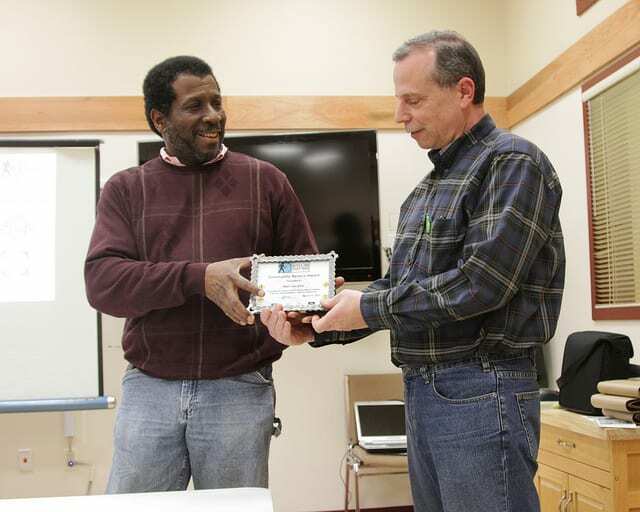 It all came about because one resident realized the business they could bring to this Montana town. 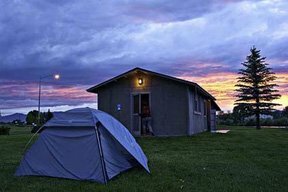 The result: residents raised funds to build a shelter in the park that would draw in riders, provide a free shower and a place to set up tents on the grass. Most riders in turn leave donations that cover the cost of utilities and cleaning supplies. And they spent money in town, which gave the local economy a boost. Other communities haven’t gone as far as building a shelter, but they, too, are learning that bicyclists bring tourism dollars. Long-distance routes, mapped and (hopefully) signposted, are a magnet that everyone can profit from. So You’ve Got a Bicycle Movie in You? In 2000, Brendt Barbur was hit by a New York City bus while riding his bicycle. Inspired to take action, he combined his passion for bikes and film and created the Bicycle Film Festival in 2001. The festival, which celebrates the bicycle through music, art, and film, has grown from its small beginnings to a worldwide event. In 2010, the festival’s ninth year, the festival was held in 39 cities around the globe and 250,000 attendees. Now in its 10th year, this international traveling celebration of bikes and the people who love them will be in New York City June 22-26. If you have a great story to tell about a bike, you should submit a short film to the 2011 festival; the deadline for submissions is April 1. Check out the trailers here. This news comes courtesy of our friends at Greater Mercer Transportation Management Association. Comments Off on So You’ve Got a Bicycle Movie in You? 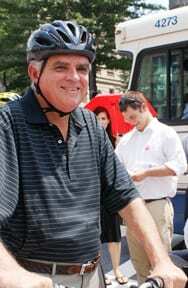 Sean Mellor of BicycleRadio.com interviewed U.S. Transportation Secretary Ray LaHood on Tuesday, March 1. Listen to the interview on the secretary’s blog, fastlane.dot.gov. LaHood discusses the 2012 budget, with a proposed increase in the transportation portion of the budget. LaHood emphasizes livability issues, multi-modal transportation, livable communities, walking and bike paths. He also discusses his campaign to end distracted driving. On March 3, LaHood spoke before the Senate Budget Committee about President Obama’s 2012 budget proposals. He said that “to spur new business and produce new jobs, we must … invest in .. .bike paths that make our streets more livable.” We heartily agree. Get your legs in shape for the first organized walk of this year’s Cross-Jersey Walking Challenge: a 40-mile group walk from Trenton to New Brunswick that follows the D&R Canal almost the entire way on Saturday, April 9. Yes, it sounds like a lot, and it’s possible to meet the group for just a portion of the walk (They expect to be at the Route 1 footbridge in Lawrence at 9 a.m., the canal and Alexander Road at 10:30 a.m. and in Kingston at noon, for example). And you can always break it down into smaller chunks on your own. Finally, if you need an extra incentive, the number of calories burned is impressive! And if you want to keep walking, there’s more planned … all part of a 100-mile cross-Jersey challenge using the East Coast Greenway. 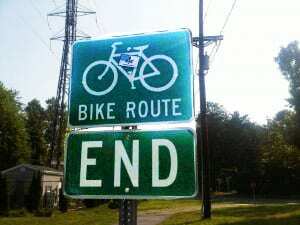 A sign that will soon disappear. 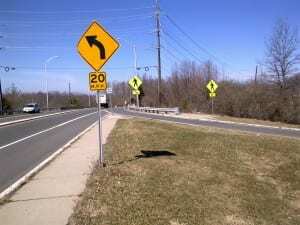 West Windsor Council in February endorsed plans by Mercer County to install a midblock crossing on South Mill Road (County Road 526) to connect two parts of the Trolley Line Trail. This is another step in getting a “rectangular rapid-flashing beacon” where the Trolley Line Trail crosses South Mill Road so that trail users can safely cross this 50-mile-an-hour road. With a push of a button, users can alert motorists to their presence. Although South Mill Road is a county road, the work is being done by West Windsor. 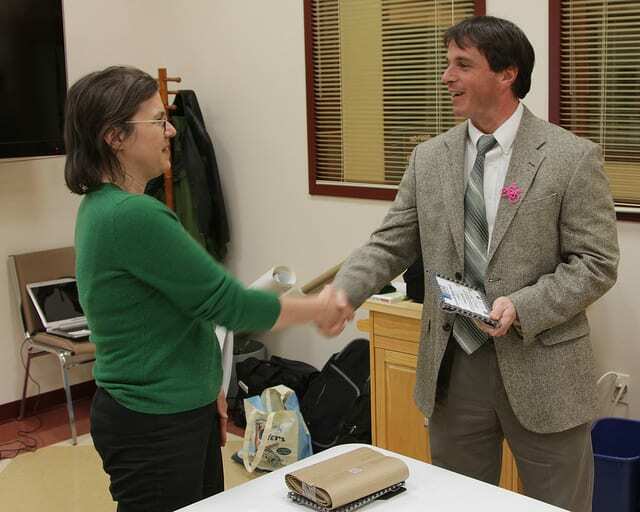 It’s a long-needed improvement to the Trolley Line Trail that the WWBPA heartily endorses.